You’re probably aware that normal elevators make use of counterweights, which reduce the amount of energy it takes to move people up and down skyscrapers with slightly frightening speed. But when it comes to moving hundred-ton boats, a little more precision is required. 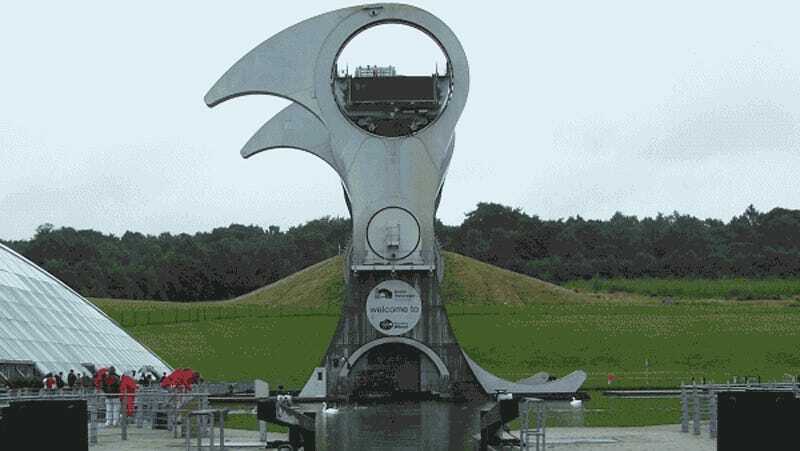 Tom Scott has an excellent video explaining the basic physics behind the Falkirk Wheel, a rotating boat lift in not-so-sunny Scotland. It enables boats to travel between two canals, one of which runs 80 feet higher than the other. To do that, it has to lift entire canal boats — themselves often 60 feet long. The design uses two ‘cassions’ — water-filled pods that the boats sit in — on either end of an arm, centered around a main wheel. The cassions counterbalance each other perfectly: they are filled with 500 tonnes of water, and when a boat enters, it displaces the same amount of water as it weighs (thanks, Archimedes). So, both arms are always perfectly balanced, which drastically reduces the amount of energy it takes to lift a boat through the air.